Reflect for a moment on the last time your doctor referred you to a specialist. When you arrived, did the specialist say, “Sorry, I did not get your paperwork, can you tell me why you are you here?” Wouldn’t it be great if your specialist already had the health information she needed before you arrived, so you did not have to remember your medications, previous tests, and diagnoses? The Direct Project offers health care providers a means to share health-related information as easily as they use email today, with security to protect patients’ privacy and a “lightweight technology architecture” that can be implemented in scaled deployments across the nation. Though the Direct Project is just one piece of the puzzle in a larger, national strategy for health information exchange , providers can use the Direct Project to easily meet the existing and future health information exchange requirements of Meaningful Use, including public health reporting, receiving structured lab results, improving care coordination, ensuring safe and efficient transitions of care, and engaging with patients. To date, several thousand providers have signed up for the Direct Project services, ranging from primary care to behavioral health providers,specialists, and public health professionals. 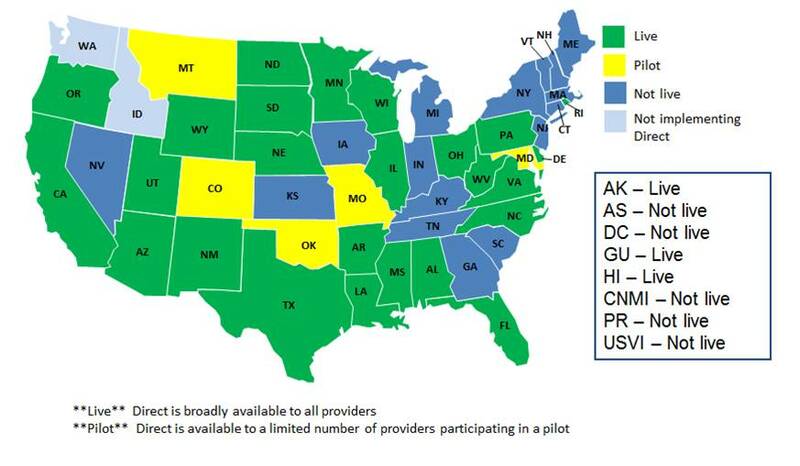 Seven states—Wisconsin, Delaware, Arkansas, Illinois, California, Florida, and West Virginia—have already signed up 300 or more providers. For more information on how grantees are driving adoption, check out our latest report at http://statehieresources.org/bright-spots/ . We’re already seeing glimpses of how the Direct Project can improve patient care coordination, save providers time, and support better care. Florida’s mandatory Newborn Hearing Screening Program (NBS) requires hospitals to screen all newborns for potential hearing impairment so that immediate interventions can be deployed to address the adverse effects of hearing loss. The NBS process, which was largely completed by fax previously, requires hospitals to submit screening results to the state, and the NBS to submit a compilation of results back to hospitals to ensure accuracy. Florida is now using Direct to complete NBS transmissions electronically and expects to not only reduce paper and ink costs for the NBS program, but to make the process of reviewing and completing reports more efficient for audiologists and other professionals performing hearing screenings. In California, RedWoodMedNet and the St. Joseph Health System are also collaborating to use the Direct Project to improve care coordination for newborns. Maternity wards will use the Direct Project to send newborns’ health information to their pediatricians and to patients’ HealthVault accounts, where parents can access their babies’ health information before they are even discharged from the hospital. RedWoodMedNet is further leveraging the Direct Project to give hospitals and long term care facilities a means to share clinical care summaries when patients are sent to or discharged from the hospital, demonstrating proposed stage 2 meaningful use requirements for the electronic transmission of care summaries when patients transition from one setting to another. Guam HIE is targeting several unique use cases with their Direct Project implementation for the Department of Veterans Affairs (VA) and the Department of Defense (DoD). Guam HIE and the VA are currently using the Direct Project to refer VA patients to providers in Guam for mammography and are looking to expand the use of the Direct Project in the future to all VA referrals, giving them an easy mechanism to ensure test and imaging results follow VA patients. They are also looking to use the Direct Project as a valuable platform for securely exchanging military patient information with the DoD. New and exciting use cases are emerging every day from State HIE grantees including sharing information with patients, sending lab results and alerts, and populating repositories to support query-based exchange. As we have seen over and over in technology development, having a standardized way to solve a basic problem—in this case, getting information from here to there securely and electronically—enables all kinds of interesting and unexpected innovation. We can’t wait to see more. Tell us how the Direct Project is making a difference in the health care you provide or experience! To learn more about health information technology, visit HealthIT.gov.